Today started off with bottles and sippy cups and Nicholas didn't want anything to do with them. So we decided to try to spoon feed some stage 2 pears to him. After the first bite he was pointing at it for more!!! I can't tell you how exciting that was for us because we haven't really seen him eat in 2 months when we tried it and really he hasn't ate in 4 months total. So we are thanking God for bringing that swallow back, we prayed for months that this would happen and it did - ANSWERED PRAYER!!! We didn't know if it would take days or weeks to get him interested but today he ate food 3 times and he did wonderful. 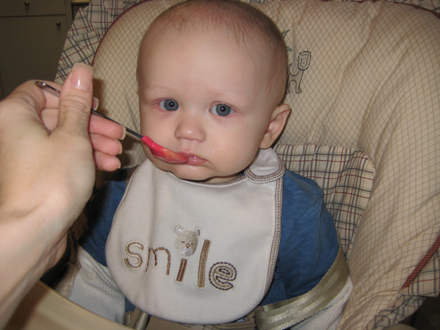 So obviously our day was great because our son ate!!! We still are working on him wanting a bottle and or sippy cup but hoping that he will find interest in that soon. 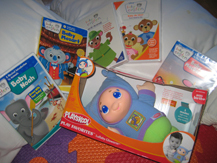 Attached is a pic of the Baby Einstein videos and the Glow Worm baby doll that Baba and Dedo sent Baby Nicholas for his 1st Birthday ---- Thank You So Much!!! He LOVES baby Einstein!!! Thank you Jesus our boy is eating, what a true blessing! We are so grateful he can swallow and that you healed him just before we leave here to go to Jacksonville. We ask that you continue to heal his vocal cord and strengthen him daily .... THANK YOU LORD!! !